Anonymous sale; Sotheby's, London, 9-10 July 1992, lot 527. Although the information has been added as an additional note, this part of the collecting history was known when the youth passed through Christie's Rockefeller Plaza in December 2004 [see details here]. So was this collecting history left off the entry for lot 139 because the staff at the auction house are not very good at compiling collecting histories? Or was it because Christie's did not want to draw attention to a collecting history that showed that the statue had passed through Sotheby's London at a period when that auction-house seems to have been receiving consignments from the agents of Giacomo Medici? And that leads to two further key questions. 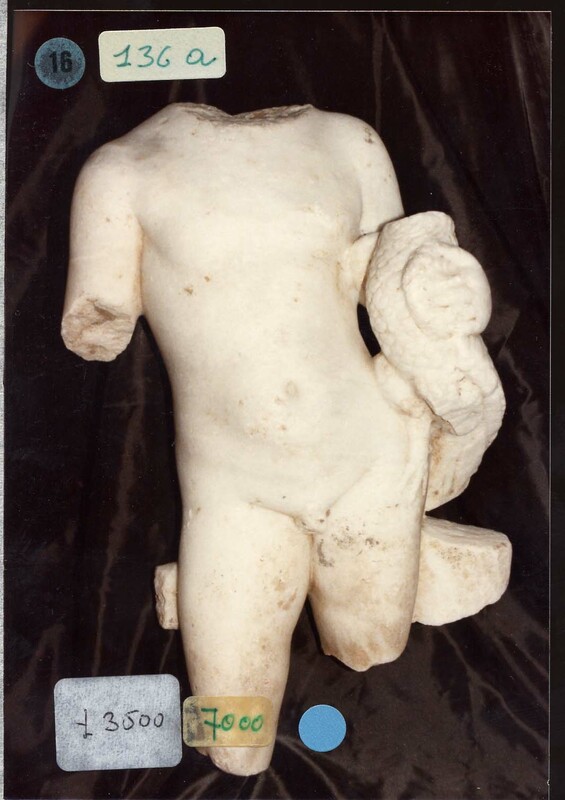 Who did consign the statue of the youth with cockerel to Sotheby's London in July 1992? Where was it prior to the sale? In any case, why does an image of a youth with cockerel appear in the Medici Dossier? From the Medici Dossier (courtesy of Christos Tsirogiannis).